USAID’s E3/Land and Urban Office supported the design and implementation of a rigorous impact evaluation of the Tenure and Global Climate Change (TGCC) project in Zambia (2014-2017). This project explored the relationship between secure customary land tenure and development goals related to climate change adaptation and mitigation. Prior to the evaluation, there was little or no evidence on whether granting customary documentation to a farmer makes her or him more likely to adopt climate smart agricultural practices. 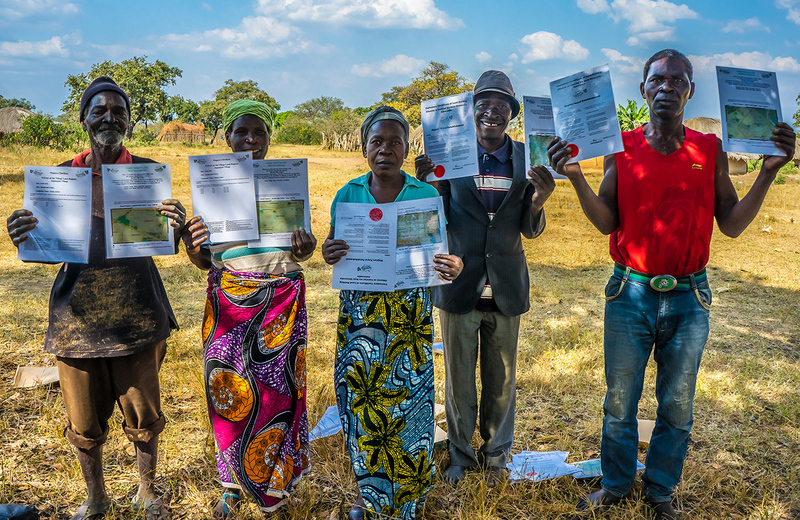 Land tenure security and property rights governance issues represent a central focus in Zambia for a range of rural development initiatives to address agricultural livelihoods and poverty reduction. 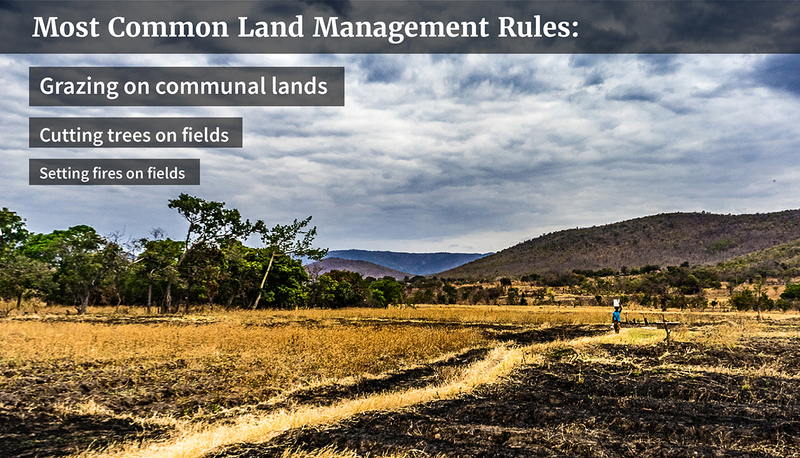 Customary land represents the majority of land in Zambia and is allocated and administered by traditional authorities, led by a chief and based on the application of customary practices. Smallholders commonly have no documentation of their land rights, which can result in complex land disputes over boundaries, defense of land rights or reallocation of land by chiefs or headmen. This is an especially pressing issue in the rural areas of Zambia, where insufficient access to arable land is a recognized driver of conflict. 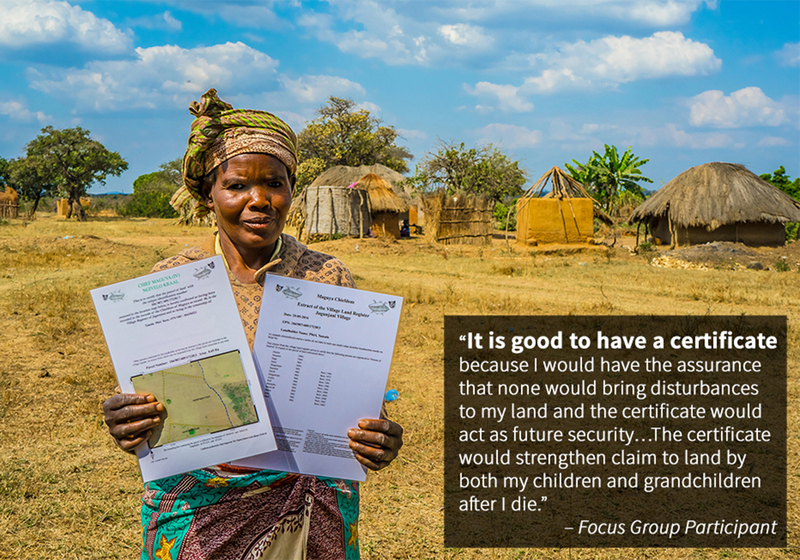 Both traditional leaders and village members are increasingly attuned to a need for documentation to assist in long-term land management. To encourage food security, Zambian agricultural policy has encouraged climate smart agriculture, and a number of organizations have actively promoted conservation agriculture and agroforestry, especially in Eastern Province. However, uptake of climate smart agriculture practices, in particular agroforestry, remains limited, despite the expected benefits to Zambia’s smallholder farmers who struggle with low yields, unreliable access to fertilizer and vulnerability to climate change. While there has been a great deal of USAID and other donor research on constraints facing smallholder farmers, the influence of resource tenure and the effects of tenure security on smallholder investment in long-term land productivity in the country is still not fully understood. As the Government of Zambia develops a new land policy and launches a land audit, national land titling program and new forest and wildlife acts, it is important to demonstrate cost-effective models for customary land documentation, administration and management that strengthen the role of local institutions and result in sustainable land and resource management. 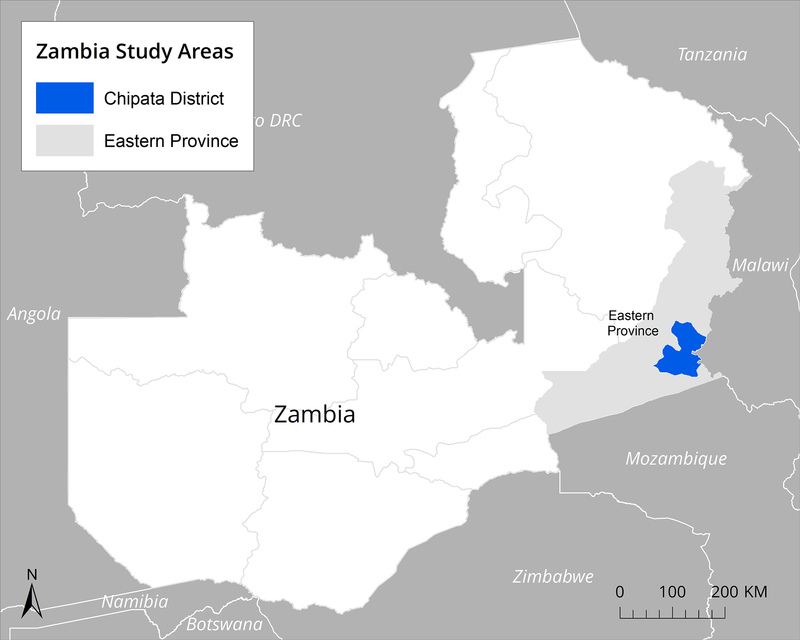 The evaluation study area included four chiefdoms in the Chipata District of Eastern Province, Zambia. The chiefdoms are: Mnukwa, Mkanda, Mshawa, and Maguya. The evaluation assesses the impact of the TGCC project in Zambia on household and field-level outcomes using four primary sources of baseline (2014) and endline (2017) data from 285 communities. These data sources include household surveys (2,896), village leader surveys (271), key informant interviews (568), focus group discussions with women, youth and land-constrained households (62) and project monitoring and evaluation data collected by TGCC and the evaluation team. For more information about the evaluation design, please see the TGCC Zambia Impact Evaluation Design Report. Prior to TGCC, households felt secure that their fields would not be taken away from them from: family members, the village headman or neighboring villages. This expectation held true for the short-term and the future. The general security of land is demonstrated by less than 1% (N=55) of households indicating having any land reallocated in the past. At the same time, households showed concern over their future security. Forty percent (N=1,409) of households believed it likely that the chief or government would give up at least one of their fields for investment purposes. Over 90% (N=3,224) expressed they would like to obtain paper documentation for their farmland. Focus group participants also indicated this strong desire for paper documentation and believed that this documentation would strengthen tenure security by providing proof of ownership, promoting dispute resolution and solidifying claims to land. Even though people felt secure about their land, disputes over fields still existed, particularly over field boundaries and inheritance. Overall, the total number of disputes over fields were low with only about 11% (N=1,007) of fields reported as disputed. Planting agroforestry trees is encouraged as these trees fix nitrogen in their roots and leaves, improving soil fertility and reducing farmers’ need to purchase chemical fertilizers. Better soil quality leads to improved crop productivity and increased yields. 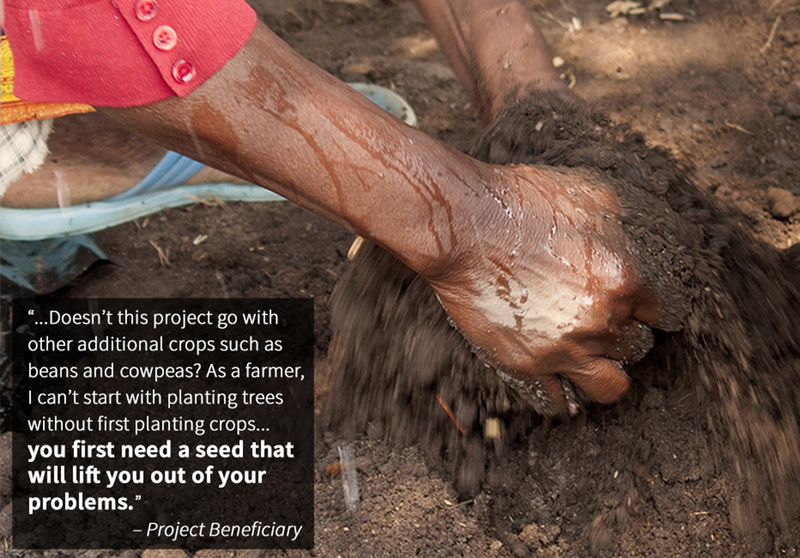 The long-term benefit is improved livelihoods for farmers. Baseline results indicated that there was a low rate of agroforestry uptake with only 11% (N=383) of households practicing agroforestry across 5% (N=404) of fields in the study. Fields were defined by how they were used for cultivation—for example a field used for maize cultivation versus a field that has been left fallow. Results suggested this low uptake rate may have been driven by a lack of access to seedlings and farmers’ lack of knowledge of the benefits that planting trees may provide. While the majority of these fields were planted with agroforestry trees to improve the fertility of their soil, only about half of the fields had seen benefits at baseline data collection. The most popular type of agroforestry species planted across the villages was the Musangu (pictured below), followed by Sesbaniaseban and Gliricidia trees. Overall, households agreed that they were satisfied with their community leaders and land governance over a variety of metrics including their leader’s transparency about their decisions, fair allocation of land across households and accountability for their decisions. 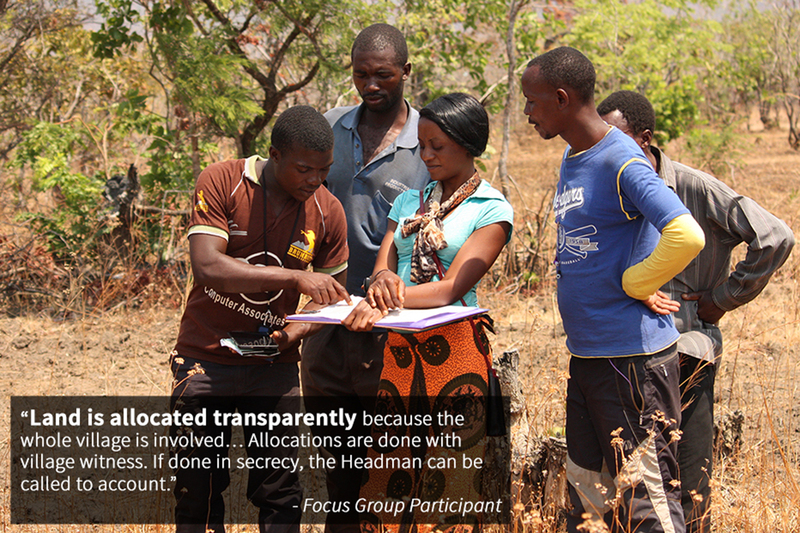 Focus group participants also indicated that they felt the land allocations were transparent and just. The most common land management rule regulates the grazing of livestock on communal land. Nearly 90% (N=225) of headmen report their village has a rule about grazing livestock on communal lands and over 80% (N=181) of headmen reported that at least half of the households in the village follow grazing rules. After grazing, tree cutting was the most prevalent rule, followed by rules about fires or burning. Most headmen reported that their communities have a good understanding of the rules. For more information about the baseline findings, please see the TGCC Zambia Baseline Impact Evaluation Report. There is strong evidence that the TGCC process of boundary demarcation and expectation of receiving paper documentation substantially increased perceptions of tenure security. At both baseline and endline, households were asked to assess the short-term (1-3 years) and long-term (4+ years) likelihood that each plot of land would be reallocated or encroached by various entities including their chief, a neighbor or family. 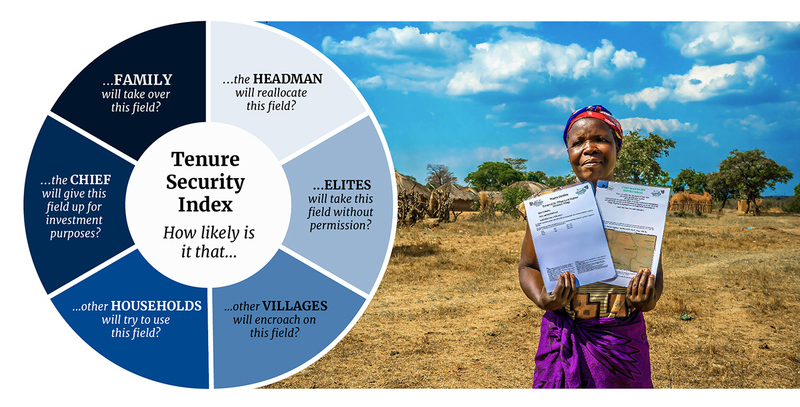 These short-term and long-term measures were combined to create an index for perception of tenure security as shown below. Households in villages that received the land tenure interventions are more likely to express confidence that their farmland is secure from internal and external sources of encroachment or reallocation. As seen in the graph below, the percentage of households fearful of encroachment or reallocation decreased across various entities. Households across every treatment group demonstrated a large decrease in their fear of unauthorized land reallocation or expropriation by chiefs. It’s also apparent that households’ greatest fear at endline was that other households will try to use their field. Focus group participants also revealed that households believe that the primary drivers of this increased sense of tenure security are having well-known and clearly defined boundaries through the demarcation process in combination with paper evidence of their customary land holdings. Roughly 80% (N=488) of households that received the land tenure intervention believe that having a customary land certificate will make it less likely for their land to be taken, both now and in the future, as shown in the graph below. Overall, as seen during baseline, disputes were low. Households believe that customary land certificates have reduced disputes about inheritance (39%, N=195) and even more believe they will do so in the future (52%, N=255). For the overall household sample, the agroforestry extension services were successful in motivating greater uptake of agroforestry as shown in the map below. In villages that received the agroforestry extension services, vulnerable groups such as female-headed households, youth, elders, poor and land-constrained groups also show significant uptake in agroforestry across fields. The graphic below shows the increase in the average number of agroforestry trees per field across all treatment groups by each vulnerable group. For example, female-headed households receiving both the agroforestry extension services and land tenure strengthening interventions moved from an average of 0.06 trees per field at baseline to 0.28 trees per field at endline. For the overall study sample, there is no evidence of improved benefits for households that received the additional land tenure support compared to those that only received agroforestry extension services. However, the study finds marginal benefits to linking land tenure and agroforestry for female-headed households, poor and elder respondents. This finding provides limited support to the argument that, at least for vulnerable groups, stronger property rights affect a farmer’s decision to practice agroforestry. In communities where the agroforestry extension services were offered, roughly a third of households had at least one household member participate in the program. Of the households that did not participate, one key reason was that they were unable to attend the initial meeting. Focus group participants also indicated that they did not participate because they preferred a program that provided inputs such as seeds. Musangu tree is the most common tree species planted across every treatment group. It can be grown amidst any crop, but the program encouraged farmers to plant their fields where Musangu seedlings were being grown with low-growing crops such as groundnuts, to ensure that the seedlings would get enough sunlight. The second most common species of agroforestry tree is Gliricidia, which is normally planted along the perimeter of a field as a type of hedge. The expected benefits of planting agroforestry trees such as Musangu trees are well known to households in Chipata district. The most common expected benefit cited both now and in the future is improved soil fertility. As shown below, the number of households who expect to see this benefit in the future for their Musangu tree is about double the number of households who currently see the benefit, indicating that households understand that the benefits of agroforestry accrue in the future. Despite understanding the benefits, some households are still skeptical that these benefits will actually materialize for them, both now and in the future. At present, 38% (N=228) of households that received agroforestry extension services see no benefits to their Musangu trees. This number drops substantially when households are asked about benefits they expect in the future (13%, N=71). Additionally, agroforestry adoption also does not appear to strengthen household’s perception of tenure security. 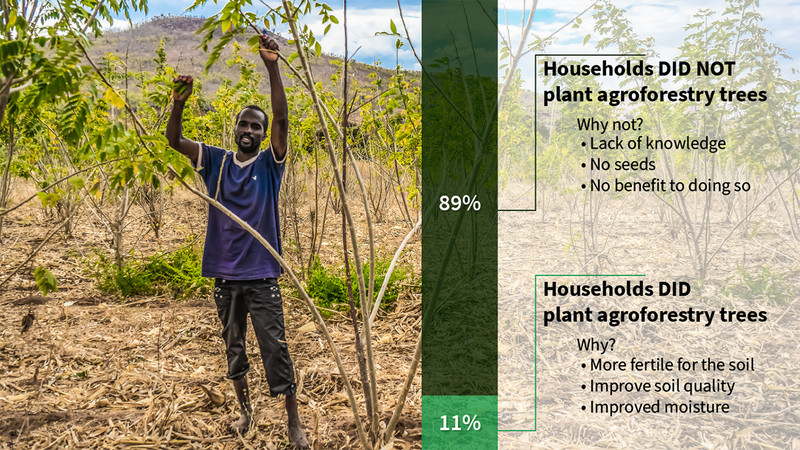 Almost no households believe that planting agroforestry trees strengthens land tenure or raises the value of their land for collateral, either now or in the future. 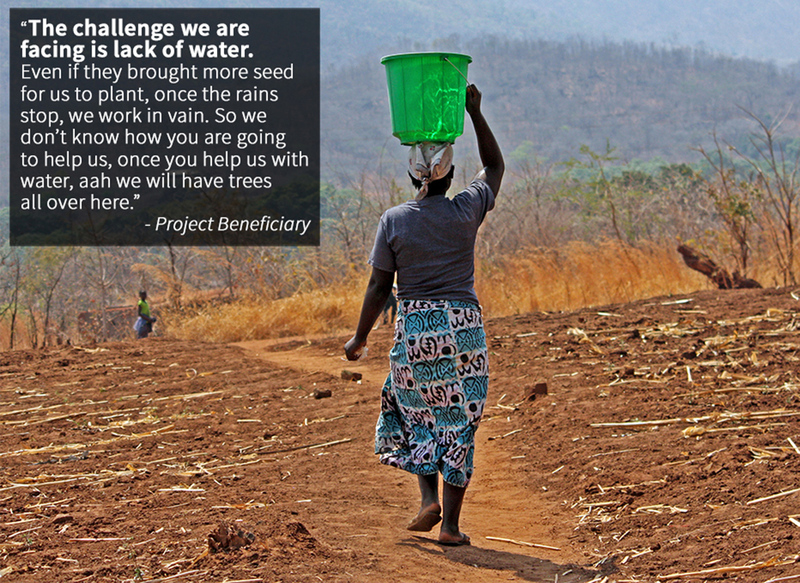 Within areas receiving agroforestry extension services, seedling and tree survival rates are low. Across all years of the program, over a third of households who engaged in agroforestry report that less than 25% (N=183) of their Musangu and Glyricidia seedlings survived. Seedling survival declines over time and is the lowest in 2016, after the agroforestry extension services were withdrawn. The map below shows average survivorship rates by village across all treatment groups. The most common challenges to agroforestry seedling survival include a lack of water for seedlings, fires burning trees, pests killing the trees and animals grazing in the field. Despite additional program efforts to construct wells and boreholes, focus group participants noted the continued lack of water. The difficulties with seedling survival show that despite interest in, and knowledge of, agroforestry, sufficient labor and time inputs remain an essential missing piece for smallholders. An important finding is the weak but positive evidence of a link between strengthening customary tenure and enhanced field investments. There is statistically significant evidence of improved labor or cost intensive long-term field investments (an index comprised of planting basins, rotating crops, fallowing and fertilizer application) for households receiving the land tenure intervention. This long-term field investment index in addition to the percent of households that feel secure by treatment group is shown below. However, the standalone results for fallowing might also indicate that households do not feel as secure as some of the perception of tenure security results indicate. For example, leaving fields fallow is particularly important for soil fertility, but is often feared because uncultivated fields are more likely to be reallocated or encroached on than cultivated fields. As shown below, fallowing is low across all treatment groups indicating that households may still fear that their land will be reallocated if their field is not in use. Additionally, the graph indicates significant variation in the types of field investments undertaken across the study area. TGCC sought to clarify resource tenure over private, community, and open access resources, and supported dialogue over community resource rules. TGCC worked with each community to document their land and resource governance rules. However, there is no change in household’s perceptions of land management decision making or their satisfaction with customary leaders. Satisfaction with customary leaders was relatively high at baseline, which may explain the lack of statistically significant findings on this issue. However, there appears to be positive impacts on satisfaction with community leaders for female-headed households. As demonstrated in the graphic below, there is a clear shift from the total number of female-headed households at baseline with low satisfaction of their community leaders to a higher level of satisfaction at endline across all treatment groups compared to the control households. There is strong quantitative evidence that TGCC has a positive impact on household perceptions of improved tenure security. Households receiving informal customary certificates report approximately a half point increase on a six-point index measuring their perceived security of tenure from unauthorized land expropriation. As expected, the analysis found no evidence of a TGCC impact on crop yields or livelihoods as these are long-term impacts requiring an additional round of data collection. The findings support the scale-up of TGCC’s documentation and boundary demarcation approach in Zambia and program piloting, and potential scaling, in other customary land systems in Africa. The benefits of the agroforestry extension should be reexamined and other climate-smart agriculture activities considered, such as minimum tillage or crop rotation, given the large labor investment and challenge to keeping seedlings alive. DID THE THEORY OF CHANGE SUCCEED? This impact evaluation provides evidence to assess TGCC’s program effectiveness and theory of change. As shown in the graphic below, receiving the land tenure intervention in addition to the agroforestry extension services does not generate increased agroforestry adoption over the extension services alone. While the land tenure intervention had a positive impact on perceived tenure security and the agroforestry extension services had a positive impact on agroforestry uptake, there is no evidence to support the hypothesis that combining the interventions led to greater rates of agroforestry uptake in the short-term for the overall household sample. These short-term results may indicate that households need to feel secure for some time before they begin adopting more time and labor intensive investments. Overall, the evaluation does not find evidence of a program impact on long-term outcomes such as seedling survival, agricultural productivity, or livelihood improvements. This is not surprising given the short three-year time period between baseline and endline data collection. There is strong reason to expect that the project effects in the long-term may differ from those in the short-term. 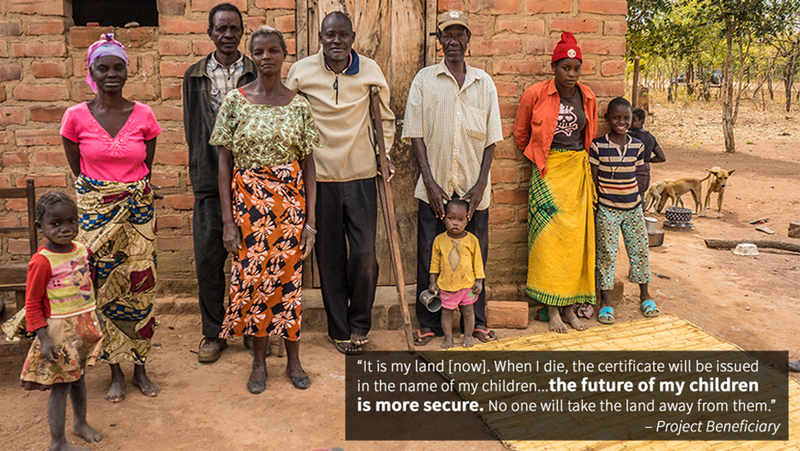 It may take time for households to trust that the guarantees of land tenure will be honored. Households that adopt agroforestry may subsequently abandon it. These longer-term indicators should be potentially explored during subsequent rounds of data collection with the same households that took part in the baseline and endline surveys. The new knowledge generated from this impact evaluation will be used to make more evidence-based decisions, ensuring that USAID continues to make targeted and sustainable investments in future programming. Another round of data collection would provide further understanding about the long-term impact and benefits of the TGCC project in Zambia. This will promote a better understanding of the TGCC program’s full policy potential and value for money, and inform other stakeholders’ decisions to take the program to scale in Zambia and other African countries with similar customary land systems. All photos by Sandra Coburn / The Cloudburst Group, unless noted otherwise.